Now with FREE STUFF for each post! Anything Spring/Flower themed or pastel colored (or green)! Feel free to 'throw' them at your fellow users! If you have extras you don't want and can't sell, toss them at newbies or posters in here! (This is completely optional and not something you have to do to chat with us). What is this nonsense, Dusty? This nonsense, my dear friends and fellow citizens of Zantarni, is my newest way to keep myself and all of you active (at least in this thread). For each post you make in this thread you will get an item. It may be a common, event item, smuggler's shop item, or even a donation item. Will it be valuable? Possibly. Will it be something I've seen you questing? Perhaps! Who know? Only you and me, but only if you post... And by post I mean, here, in this thread. This place is a safe haven for everyone, and I mean everyone. Oldbies, newbies, returning members, regular members, lurkers, posters, just anyone and everyone. So please, be nice, welcome everyone, and get to know your fellow members! This will be a weekly theme that I post, if you have extras of anything you want to get rid of within the theme, feel free to 'throw it' at someone in the thread! This is purely voluntary and not required at all, so don't feel obligated to do anything! So, what do I do to get free stuff? Just post! Tell me about your day, tell me something about yourself, discuss video games, talk about your favorite tv show, or even what you fed your cat for its dinner. Just talk to me (and everyone else in the thread)! Then ask me a random question (but be prepared to answer it in return)! You could also share your favorite poem, show off your favorite avatar (or ask for dream avatar help), ask any question about Zantarni (I'll try to help), or any other thing (random or not) that comes to mind. -How's you day going? Anything on your mind? -Any music/books/games/tv shows/ect... that you've been particularly interested in lately? -Do you have any hobbies? -Any accomplishments that you want to share? -Don't ignore people, if someone says "Hey everyone" say "Hey ____" back! If you want to donate to help me keep this open please send your donations to Ambition! Dusty's Mule Account; Please direct all PM's to Dusty! I only check here every once in a blue moon. I always need a nap, even upon waking in the morning. It's almost time to pick an area to precept in (follow one nurse for the semester and take care of his or her patients by yourself with supervision). I'm contemplating precepting in pediatrics. If I don't get it, I'll try for medical ICU. How have you been, Dusty? I'm hoping it will draw a few people out (and maybe a few newbies in). Aw, I've heard nursing school can be really rough. I feel the same way right now (probably to a lesser extent though). I have 8 am classes every morning but I have to stay up until 12-1 am doing school work. And after running all over campus all the time (and it's a rather hilly mountain campus) I get pretty tired too. It beats waitressing though. I wish you luck getting in! A friend of mine had to do the same not too long ago, I think she ended up following a local nurse practitioner around this semester. I've been okay for the most part. My brain feels a bit overloaded and tired, but Easter Break is around the corner and the most stressful part of my semester (registering for classes and getting all the ones I need for next semester at reasonable times/finding a place to live) is over with. And it all went pretty smoothly. I'm in project/paper/presentation limbo right now. I've been trying to figure out what I want to do when I'm done with college though. I'm a Geography major. And I really want to go into Meteorology or Climatology, I just don't know which field or what part. I guess at any rate I'll be in school for at least 2 more years (hopefully 3-4 so I can get my master's degree) so I've got plenty of time to figure it out. I just don't know what to start looking at grad school-wise. I like your idea too, and hope other people join in too. I am not in university yet, but have recently finished school. I am so glad it's done now. I was really stressed out near the end. I can't wait to go to school hopefully in September though. I plan to major in International Studies if I get in. Good luck getting in Riley! And thank you! I hope they do as well! I'd love for people to come in and post, even if it's just for the items. That's awesome. I remember being really happy when I graduated from grade school (it's nearly been two years ago now). I wish you the best of luck getting in! International Studies sounds interesting. What type of job/field of work are you interested in going into? Thanks! I am good with languages, so I either want to be a language teacher or a translator. I plan on taking Japanese and Mandarin, since I already started learning Japanese, and I really want to learn Mandarin. Cowabunga! Hi Dusty. Was just thinking it would be really awkward if I killed your thread, so here's hoping my jinx wore off! On languages: I'm fluent in English, teenager, and sarcasm, and speak a little computer geek, but I'm rusty. @ Sassy: Welcome to the thread! Ha ha, I doubt you will. I'll respond if no one else does! @ Dorothy: That's awesome Dorothy! I used to want to be a linguist. It was on my radar after I finished reading LoTR by Toliken, but I think I gave up after I failed my Latin class my freshman year of college (avoid Latin, unless you like languages that are dead, gone, and that no one will ever use in application). I started college as an Anthropology major and switched to Geography about halfway through last year after I realized how much I loved studying weather and climate. I studied Early Childhood Education and Business. Don't ask me what I planned to do with it, I have no idea any more. But I work in an elementary school, so it all panned out. I probably won't take Latin anyways. I'm not sure if the university here even has it. I find weather and climate learning boring, but I'm glad you found something you like. For me, I know English, some Japanese, and very little French. I like sarcasm, but am not completely fluent in it. Sassy...Early Childhood Education and Business? My guess would have been that you wanted to open a daycare. I used to want to be a linguist. It was on my radar after I finished reading LoTR by Toliken, but I think I gave up after I failed my Latin class my freshman year of college (avoid Latin, unless you like languages that are dead, gone, and that no one will ever use in application). You just made me think of something! I'm only fluent in English (and sarcasm), and was feeling a bit left out with the languages talk, but you reminded me! I read the LoTR when I was in middle school, and I fell in love with the dwarven runes. My best friend and I committed them to memory, and we could read and write them as quickly and easily as we do English. It certainly removed the threat of a teacher catching us passing notes and reading it aloud to the class to punish us. twins,... i have a hard enough time getting my kids paired with the right name as is, and they arent mirror images! name tags. thats how you did it, huh? @ Sassy: That's a cool! And it's good that everything panned out. (We'll see if I can actually get a job that I've been thinking that I want with my degrees when I graduate). I kinda want to be a disaster management planner or something. (To, you know, prevent as much damage from happening as I can. I'd want to work on more of a local level though, like for a city rather than an entire country... I don't really know if I want to work for FEMA). @ Dorothy: Ha ha, that's good. Latin is a nice/good language and all... I'm just bitter after having a professor that taught out of the book and giving no outside help (I failed the course). And that's okay. I know my interests are a bit on the strange side. I'm in a general education Geography class called Global Change in the Biosphere (we're in the climate change section now), and my classmates think I'm crazy for being in love with learning about big storms like Hurricanes/Severe Thunderstorms/Floods. Japanese is a cool language. I wish I had the time to learn more languages (without being graded on them). I really want to learn Danish and German. 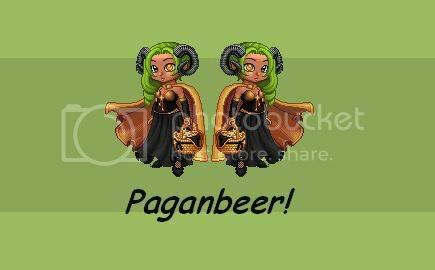 @ Pagan: Thanks! And, okay! I might make a 'no sending' list just incase anyone else that comes in wants to post but doesn't want to collect stuff. And Absolutely! You can send any donations to Ambition. That's where I'm keeping the bulk of what I'm throwing at people. That's awesome! I used to know how to write my name in dwarven runes. I really wanted to sit down and learn both the elven language and the dwarven language, but for whatever reason I never did. Maybe I'll tell Will that he should stop learning Arabic from his phone and see if there's an app for either of hose. My friend and I sat next to each other, so usually we'd write notes along the side of our actual class notes. The teacher couldn't take them away because they were on our actual notes, and usually we were managing to keep up with her anyways. @ Rakurai: One of my friend's mothers had a hard time keeping her two sons' names straight (even though there was a 4 year age gap between them). She just yelled "Bob" and both of them would respond. (Though, neither of their names were Bob). @Rakurai No, lucky for me they're fraternal. I actually had nightmares while I was pregnant that they would be identical and I would mentally scar them for life by mixing them up. However, I do manage to blend my childrens, grandchildrens, and pets names into whole new words, depending on how worked up I am and who I'm irked at. @Dusty: I don't think I'd like to work for FEMA. They get such bad press that I can't honestly tell if they do any good or not. Around here, people can volunteer for emergency management. Maybe that's possible where you are?